Homecoming - The first story I ever wrote was Homecoming (although the first released story was Speak Now or Forever Hold Your Peace). I wanted to do a Sappho story with her being a female Autolycus - a real ladies lady <G> who had eyes for the bard. It would force Xena to make a decision. But I needed a plot to put around my simple 'first-time story' so I made a simple murder mystery. Coming Home - People reacted enthusiastically to Homecoming so I created the sequel - Coming Home. In Coming Home, I had the warrior and bard returning home to tell their families of their joining on Lesbos. I used my own personal 'coming out' experience with my parents - my father was upset and (although he didn't react quite as harsh as Gabby's dad) it didn't sit well with him at all. It took him awhile to feel comfortable around me. My mom told me the next day that she was my mom no matter what choice I made in life. I saw Gabrielle's parents in a similar light with mom being the more accepting of the two. An online fan wanted to see something with Artemis so I added a 'God Problem' <G> to it for conflict. It also gave me the chance to spotlight Cyrene, which I was hoping to do. Home Sweet Home - People reacted enthusiastic to Coming Home as well and kept asking - 'what happens next?' I answered them with Home Sweet Home. Home Sweet Home is a title built on irony. There's nothing 'sweet' about it. I felt the series was getting too sugary sweet and the characters cartoonish in their love for each other. Stories lose interest to me when the terms of endearment get me nauseous <G>. Don't get me wrong - love is grand. But it can also be hell. I wanted Xena and Gabby to have a rift more believable than the third seasons <LOL>. But I wasn't sure what it should be. Given Gabrielle's mothering, affectionate nature the choice was easy - motherhood. Something that Xena, a woman who would give Gabby the world if she asked, couldn't give her. It's also something that Gabrielle herself doesn't understand until Zagerus (the warlord buffoon from 'ADITL') lays siege on the Amazons. But I wanted to add a modern day element, which the series often does. So I did - Couples relationship therapy courtesy of the village healer. No Place Like Home - In the next tale, No Place Like Home, I did the unthinkable. And boy did I catch Hell over it at the time (LOL) SPOILER ALERT IF YOU DON'T WANT TO KNOW........ I killed the bard at the very end. 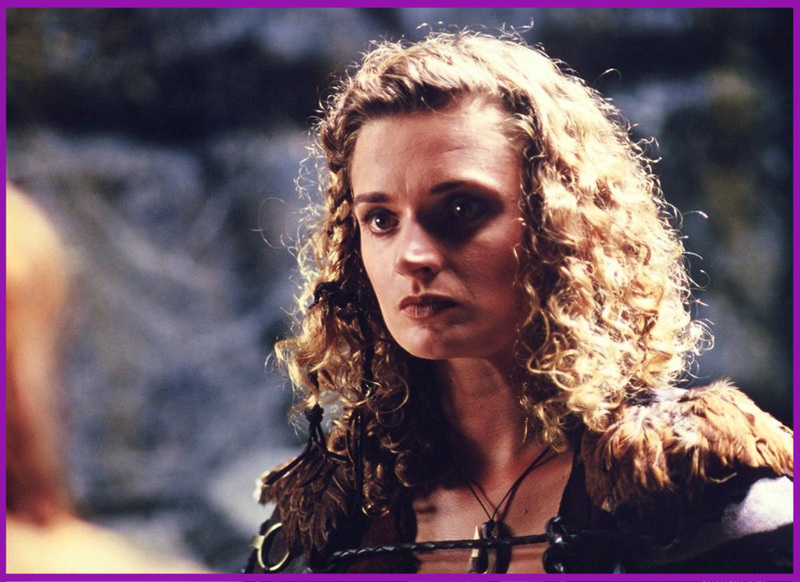 Xena and Gabby get their wish of a child (two children actually thanks to a screw up by Cupid (G)) but their happiness is short 'lived' when Gabrielle has complications with the pregnancy. When my own daughter was born I got an infection that they didn't identify for three days. She was fine. I was not. But as you see, it did work out because I'm still here (G). Home At Last - I wrote, Home At Last, instead of giving up after catching hell for No Place Like Home (again spoiler alert ahead!). The reason you may ask? It wasn't because of the hate mail. It was because of all the people who said they actually cried as they read Xena struggling with her loss of the bard. It was for all the people who begged me to continue but didn't bully me. It was for those kind folks that I continued the series. As for the story, Hades calls Gabrielle to his realm so she can 'straighten things out' for when the duo finally arrive for good. That means tying up the loose ends with our favorite red shirts (G) Perdicus and Marcus. Of course Xena has to deal with her grief. Of course the Gods have to be petty. And since I loved 'Clash of the Titans' it felt like a wonderful way to put Xena in the situation like she did in Ulysses. Of course the bard is returned in the end and Hades reveals himself to his daughter who's very thankful to have her wife home with their children. I'm not sure if I'll continue this series anymore. I've considered jumping forward to the children being young all the way to them being teenagers. Inspiration hasn't struck yet but if it does you just might see another tale of gals and their youngin's (G).